1.Discover the hand made deliciousness from high level heating and short time cooking! A direct gas heating system and the shallow pan enable short time cooking at high temperature in a large volume of foods. The multi-shaft stirring blades, which revolves, and rotates, assures no scorching even at a low speed and provide efficient mixing. 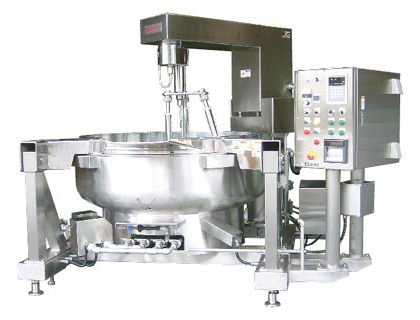 Applying the patented SWS:Self-weighing System(Option), not only heating and mixing conditions but completion timing of products can be input. This system ensures the automatic control for constant finish of products in repeated batch production. Filling, Saute, Fried vegetables and meat, Curry roux, Sauce, Soup, "Tsukudani", "Denbu", "Kinpira," etc.